Laser hair removal is an FDA approved process by which a beam of light targets hair follicles and destroys them so that they become incapable of growing hair. Through this process, the laser light destroys multiple hair follicles simultaneously. It is considered the fastest, most convenient way to reduce hair growth on the body. This procedure, done in a safe and effective manner, has been shown to greatly increase self confidence, cut down on grooming time and offer years of enjoyment free of waxing, depilating, epilating, shaving, tweezing and other non-permanent methods of hair removal. At Laser by Monica, we are able to treat both men and women of all skin types safely, using dual wavelength lasers that have both a 755 Alexandrite for lighter to medium skin, and a 1064 Yag for medium to darker skin. All skin types regardless of color can receive optimal treatments that greatly reduce hair growth. We never use IPL (Intense Pulse Light) technology as we do not consider this as effective as lasers for hair removal. In maintaining client expectations, we only use the most effective true laser technology. Every treatment we perform is a detail-oriented service that not only removes hair, but aims to create a natural look that “blends” in with the rest of the body. These treatments go beyond removing unwanted hair, striving to create a personalized treatment that clients can feel comfortable with, knowing that it is suited specifically for their unique needs. Laser by Monica is a laser hair removal concierge service, treating clients in New York City, Manhattan, Murray Hill, and surrounding areas. We offer our clients optimal results in a private environment with one of the most experienced NYS certified laser hair removal specialist. Contact us today to set up an appointment and stop wasting your time and money on less permanent results. What does a DeBeers Diamond, a priceless work of art and your skin have in common? The technology that creates beautifully cut diamonds and preserves priceless historical artifacts is the same technology we have invested in to take care of your skin. QUANTA state of the art lasers are handmade in Italy with the most advanced technology available. These lasers are not for technicians, but for Aesthetic Laser Specialists who transform their craft into an art. They are designed and engineered to be the best. QUANTA has set the standard by which all other systems are judged. With the ability to fine tune and customize treatments, you will receive the finest care available. Imagine, having choices in how your treatments are delivered. 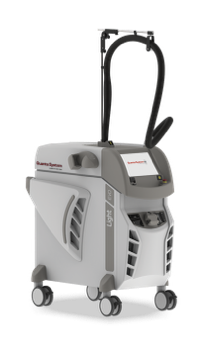 The QUANTA EVO Light not only moves exceptionally fast – up to 10 hertz repetition rate for ultra-fast treatments – but has the option of two types of coolants so that we can customize treatments to make them as comfortable as possible for you.